There are some splinters waiting to work loose and grab hold of feet. Are you planning on sanding it or just a quick paint job? I didn’t want to have to sand off the current paint(s). 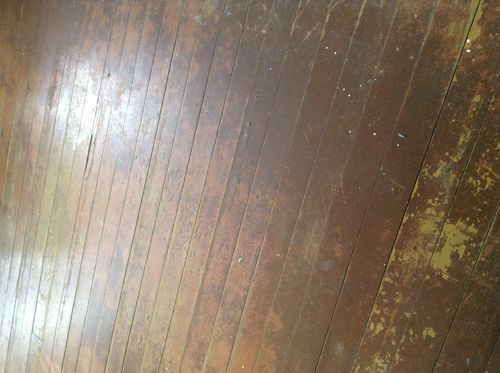 I really like the worn-floor look but I’m not sure how to make it “splinter-safe” without sanding it. If you have access to a buffer, give it a good scrub with an abrasive pad (not sandpaper). 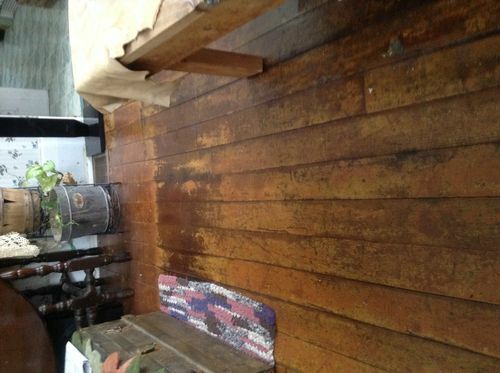 Then reseal the floor with several coats of low sheen polyurethane. And I happened to check my email while in town and so we now have the poly reading and waiting. Beth has a great idea. The loose slivers will get jambed in the pad. Use a low abrasive pad at a slow speed. (Too high of a speed will burnish the old finish and make any topcoat difficult to adhere and lead to pealing.) You may have to stop now and then to clean/pick them out or have a few pads available to keep the slivers from scratching or burnishing shiny spots, i.e. circles, on the old finish. A matte finish top coat will seal in the patina. If there are large loose foot stabbers, glue them down and set a weight on it before abrading. If any large chunks come loose, a little touch up with stain or paint thats a close match to the floor color will fix that. Today is the day that we tackle the floor again. Not sure if we will get to the urethane stage but it will be close. My daughter saw it for the first time today and she also loves it. Thank-you everyone for your help! What procedure did you end up using? We ripped up the carpet and pulled the million and one staples from three different floor coverings. I swept the floor, vacuumed the floor, ran the dust mop over the floor, wet mopped the floor and when it. Was dry we put on a coat of fast drying clear satiin polyurethane. We let it sit for 6 hours and then applied another coat. The next morning we put the quarter-round back on. And moved in the furniture. All cleared our, surfaced and re-furnished in two days. And here is the view from the old living room with its new flooring. 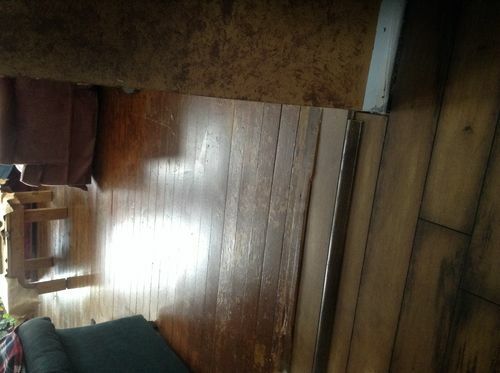 Notice how the worn floor goes so nicely, in my opinion, with the laminate flooring as well as the wall that I had painted several years ago. How did I know that it wood look so good with the hidden floorboards. Sorry about the rotated pix…not sure why the upload keeps putting my pix on their side. Looks great Debbie! I’m sure the photos don’t do it justice. There were some others on LJs that were having pics go sideways also. Glitch?